Cute, festive, bright and colorful magnetic decor fun for the young and the young at heart! Head Dimensions without black top hat and red green striped scarf, approx 7-1/2-inch wide x 6-inch tall. 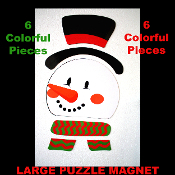 1-Magnet Set of 6 individual pieces to make a snowman puzzle.